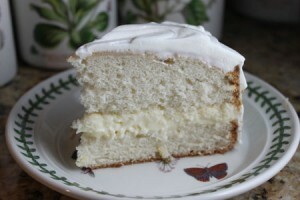 Lemon Cream Cake inspired by the one served at Olive Garden. Preheat oven to 350 degrees F. Grease and flour a 9 inch round springform pan. Make cake mix as directed on package using ingredients called for on package. Pour into pan and bake for 43-45 minutes or until a toothpick inserted in cake comes out clean. Let the cake cool in pan for 20 minutes, then carefully invert from pan and invert again onto a rack. Let cake cool completely. While cake bakes and cools, prepare filling. In medium saucepan, mix together the sugar, cornstarch and water. Whisk in the lemon juice and egg yolks. Set the pan over medium heat and cook, whisking constantly, until mixture boils and thickens. Cook over a steady heat, whisking constantly, for an extra minute after mixture has begun to boil. Remove from heat and stir in lemon zest and cream cheese. Stir until cheese melts. Set aside to cool. When lemon mixture is cool, whip the cream in a mixing bowl and fold in cooled lemon mixture. Split cake horizontally. Place bottom half of cake cut side up in pan. Spread lemon mixture over cut cake, then top with second half of cake. Cover with plastic wrap and chill for 4 hours or until almost ready to serve. Make Frosting. Beat the heavy cream, sour cream and confectioners’ sugar in a large bowl until stiff peaks form. Remove side of springform pan from cake. You can keep the cake on it’s base. Spread whipped cream frosting all over the cake.